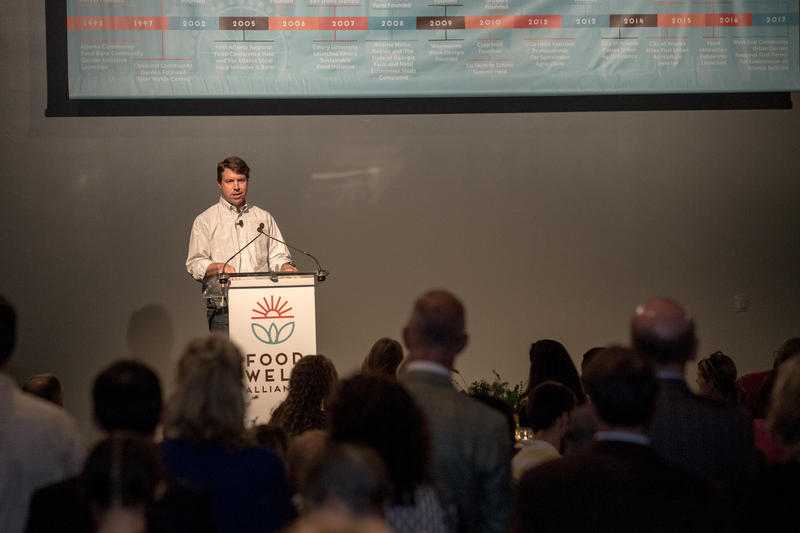 ATLANTA, October 9, 2017 /3BL Media/ - At its annual Love Local event, Food Well Alliance released Atlanta’s first Local Food Baseline Report, a snapshot of the social, economic, ecological and nutritional impact of the city’s current local food system. A $2 million grant from the James M. Cox Foundation was also announced at the event. The baseline report provides a snapshot of the history of Metro Atlanta’s food movement, as well as what it looks like today. The report focuses on four core areas where local food benefits the community: economic development, community vitality, health and nutrition, and environmental stewardship. Examples of successes and leadership are included in the report, demonstrating the strength of diversity, creativity, ingenuity and collaboration. Food associated with high levels of well-being, of social justice, of stewardship, and of system resilience is grown locally by farmers and gardeners right here in Atlanta. Teachers and healthcare providers are critical to awakening Atlantans about the importance of eating local, fresh, nutritious food. While powerful local food statistics exist in Atlanta, there is little access to common success metrics or a shared vision for the city’s local food system. Although local food cuts across all demographic and geographic lines, Atlanta’s urban gardens are clustered in the city’s lowest-income neighborhoods – areas where community gardening is arguably making the greatest impact. Twenty-five percent of people in Metro Atlanta – over 800,000 – have no car and live more than a half mile from a grocery store. The diet of people living in these neighborhoods is likely to be too high in processed, low-nutrient, high-calorie foods. The report’s complete findings can be viewed at www.foodwellalliance.org. The creation of Food Well Alliance was made possible through funding from the James M. Cox Foundation and through the vision of Jim Kennedy and Bill Bolling. Together, they saw an opportunity to connect members of Atlanta’s local food movement to collectively build a healthier community. Food Well Alliance has brought this vision to life. Food Well Alliance envisions a livable, resilient Metro Atlanta growing, sharing and eating healthy, local food. Our success is driven by collaboration, working with organizations and individuals to create thriving communities with measureable environmental, economic, community and health impacts. Food Well Alliance unites communities in Atlanta to build a robust local food system - a network of individuals and organizations that grow, process, distribute, consume and recover fresh local food.